Looking to purchase silver bullion but a little unsure on the products invest in? Take a look at our top 5 bestselling silver investments, here we will give you some background information about the product and the kind of investor they appeal to. 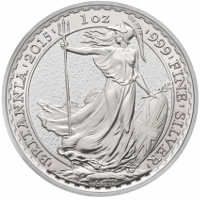 Much like the gold Britannia, the Silver Britannia offers high flexibility in a small unit size. As British legal tender the 1oz Britannia is CGT exempt. Multiples of 20 are supplied in Royal Mint tubes, ideal for investors buying larger quantities. 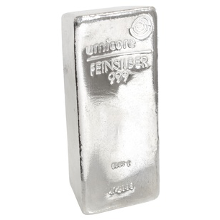 Fineness: 999.0 (99.9% pure silver). 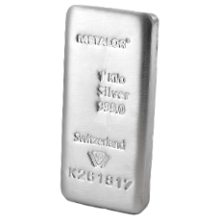 The 5kg bars are popular with investors looking to make considerable silver investments. Frequently purchased in multiples, investors are drawn to the larger bar as they offer great value for money. 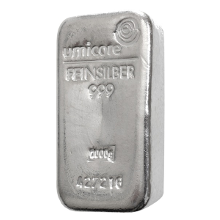 Larger silver bars are often bought by keen silver investors or individuals looking to diversify their current portfolio. Our most popular silver investment, the 1kg bar offers investors the ideal mix between value for money and size flexibility. The modest value of the 1kg bar frequently appeals to smaller or first time investors looking to avoid the added premium of coins. The 500g bars are popular with investors looking to make considerable silver investments but want smaller units. The modest value of the 500g bar frequently appeals to smaller or first time investors looking to avoid the added premium of coins. 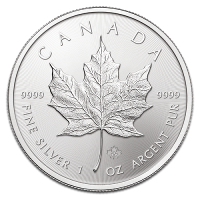 The silver Maple is one of the most commonly recognised bullion coins in the world. Its small size makes it easy to store and sell, making it an appealing prospect for many investors. Investors in this coin will tend to be unconcerned about CGT. We cannot offer personal investment or tax advice. This guide aims to offer a useful source of information and opinions to assist people in making their own informed decisions. If you do require detailed tax and investment advice, you should seek your own independent advice from an appropriately qualified adviser.